In an email titled, “Help me drain the swamp!,” Kelli Ward announces her intent to challenge first term Sen. Jeff Flake in 2018. Flake has determinedly worked to undermine Republican presidential nominee Donald Trump while essentially giving his full-throated support to corrupt, scandal plagued liberal Hillary Clinton. In one of her final essays, conservative icon Phyllis Schlafly exposed Jeff Flake as a “disreputable globalist.” She had previously written “Trump battles globalist Republicans,” which we covered in Schlafly: Trump treated with hostility; Flake leads the pack. Except for a stint leading the Libertarian, “limited government” Goldwater Institute, a fiscal but not social conservative group, Flake has spent his career at the public trough, even breaking his own pledge to term limit himself to stay in the heady atmosphere of Washington, DC. Searching all of the laissez-faire Goldwater categories, even “regulations,” we were unable to find a word either pro or con on Prop. 205 the disastrous effort to legalize recreational marijuana on the Nov. 8, General Election ballot. Silence often speaks louder than words. In the early 1990s Flake was a registered foreign agent for Rossing Uranium, a company operating a mine in the South African country of Namibia that is among the world’s largest suppliers of nuclear fuel —- partially owned by Iran. 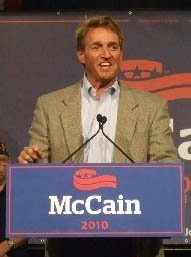 He earned approximately $7,000 monthly opening doors in the our nation’s capital and promoting the firm, according to records obtained by National Journal, which writes, “Flake’s little-known time in the influence industry stands in contrast to his carefully cultivated image as a Washington outsider.” As a lobbyist he gained D.C. access for the nefarious uranium dealers. Flake is oozy with Obama, as a regular traveling companion and White House basketball teammate. Senate Conservatives Fund noted that Flake was one of only two Republican senators who disappointingly didn’t vote on whether to cut off debate giving the Democrats the power to fund Obamacare. The conservative vote was “Nay.” His leftist votes on matters of extreme impotence can be seen here. Conservative Review rates Jeff Flake an “F” along with is mentor John McCain. Gun Owners of America asks, “How Many Times Will Jeff Flake Stab Gun Owners in the Back? — One time? Or four?” Flake rates a zero from the League of Conservative Voters. Despite the Arizona Republic’s super-sized efforts at whitewashing and repackaging him, Flake is beatable. Dr. Kelli Ward, a physician and two-term conservative state senator has been through the McCain wood chipper— he actually accused her of being soft on ISIS terrorists! — and is ready to take on the marginal Flake. Though Flake gives lip service criticizing government waste and advocates reducing federal spending, he is a committed proponent of the illegal invasion of the United States. The two issues are incompatible with one another, with costly benefits and numerous other services illegals access soaring astronomically, as they displace American workers in a still depressed economy. Don’t look for Jeff Flake to address what Immigration and Customs Enforcement refers to as a “crisis situation” on our porous border as illegal aliens boldly invade the U.S., claiming “refugee” status. In fact, Flake and McCain were the architects of the Gang of Eight amnesty bill on which they colluded with the most liberal Senate Democrats, including Charles Schumer and Richard Durbin, and a couple of other Republicrats. In 2012, flagrant phony Flake was given more than a lift by McCain and retiring Sen. Jon Kyl. Even so, he barely made the cut against former U.S. Surgeon General Richard Carmona. As evidenced by his actions, his associations and his votes, Jeff Flake is beatable. Conservative Kelli Ward is up to the task. She needs our help to be competitive. Conservative Dr. Rich Swier posts a revealing article about what actually drives Paul Ryan’s leftward skew. Ryan, it will be remembered, was sold to us as Mitt Romney’s fiscally sound — even conservative — Wisconsin whiz kid running mate, who could move mountains and cause rivers to alter course. Romney, a slickly packaged GOP establishment-approved presidential candidate who as Governor of Massachusetts sold his own brand of Obamacare to unsuspecting state residents, had a willing partner. Romney was trounced by Obama and is now relegated to insignificance. In Oct. 2015, Ryan succeeded the unpopular John Boehner as House Speaker. A squish sold as a conservative, Ryan has shepherded the funding of Obamacare, Planned Parenthood and the misuse of taxpayer money to fund 100,000 un-vetted Syrians “refugees” for a free taxpayer funded ride in cities across the United States. If you missed Donald Trump’s 7th Arizona visit Saturday….. Meanwhile, Saturday’s edition of the Chicago Tribune — Obama’s hometown newspaper — has called for Democrats to ask Hillary Clinton to step aside in favor of her VP nominee Tim Kaine, amid the re-opened FBI criminal investigation into her ongoing lies and reckless disregard for national security as Secretary of State. WikiLeaks plans to release another 15,000 emails to add to the already damning evidence against her. Election Day is 10 days away. The Arizona Board of Regents is the governing body of Arizona’s public university system, providing policy guidance to the state’s three universities.The Governor appoints eight volunteer members for staggered eight-year terms. Obviously they have a job to do — but we, the citizens of Arizona are neither absent nor incapacitated. As taxpayers, parents and students, we foot the bill for the ever increasing tuition and fees to ensure the university presidents get their overly generous salaries, perks and bonuses. The following two posts provide a bit of perspective: Michael Crow, Sybil Francis: A$U’s pricey duo is from Feb. 2013. In 2014, we pointed out what a deal we were told we were getting for our money: Gifting ASU’s Prez with $95K raise+benies = one helluva deal. The front page article in the daily newspaper the next day, carried a more ominous headline, “Regents end inquiry into UA medical school in Phoenix, but keep report under wraps.” The newspaper account details the closed-door hearing and refusal of the media request to release a copy of the report after the Arizona Medical association, representing 4,000-member doctors, requested an independent review of the circumstances surrounding the departures of Dr. Stuart Flynn, longtime dean of UA’s Phoenix medical school, and a half-dozen leaders on his management team. The medical association wanted the consultant’s review to include interviews of Flynn and other departed leaders. The article also included this separately boxed haughty comment from Greg Patterson, the chairman of the Board of Regents: “The board does not believe that additional board inquiry is necessary at this time.” Period. End of discussion. The Regents include lawyers, lobbyists, a doctor, business and civic leaders, a Hopi tribal leader and educators. We might be better served with a few construction workers, waitresses and auto mechanics in the mix — regular folks who struggle to send their kids to college. The arrogance level might decline to more acceptable levels. This morning, FBI Director James Comey informed congress that his agency is reopening its investigation into Hillary Clinton’s email server, the use of which threatened the national security of the United States. In July Comey shockingly announced that despite Clinton’s obvious deception, he would not recommend charges against her for mishandling classified information on her private email server while she was Secretary of State. WikiLeaks information has made that stance impossible to defend. FBI Director James Comey’s Oct.28, 2016 letter to congress can be read HERE. 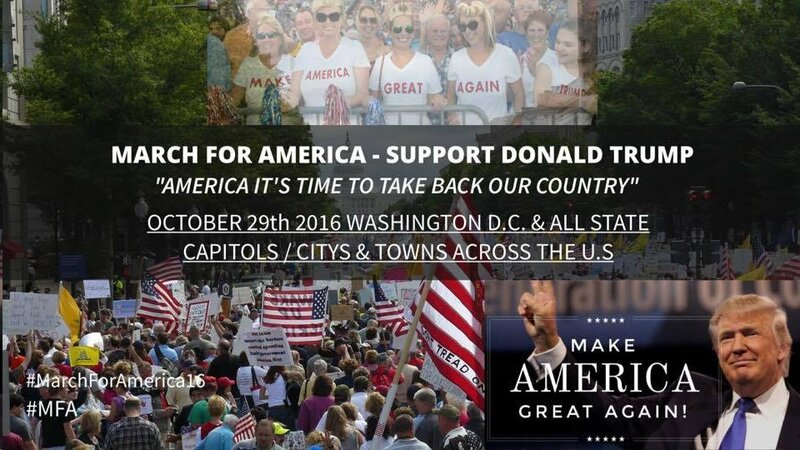 Join the movement and march with other patriotic Americans in Washington, DC, as well as cities and towns across America as we unite in support of Donald Trump and the Trump/Pence ticket. For more information on March For America 2016 log into Facebook. Check out where other marches are taking place, follow the links. More here. Need proof that the feds have things bassackwards? When it comes to scandal-plagued and utterly dishonest Hillary Clinton, the U.S. Attorney General Loretta Lynch clandestinely meets on the tarmac of Sky Harbor airport for a tête-à-tête with Hill’s husband Bill aboard a private jet — ostensibly to discuss grandchildren. And, though FBI Director James Comey found compelling evidence of concerning issues in Hillary Clinton’s use of multiple private email servers, he concluded that he would not recommend charges against her, though he conceded Clinton and her aides were “extremely careless” in handling classified information. Comey refused to recommend an indictment against Hillary Clinton, despite “evidence” she violated laws pertaining to the handling of classified information, jeopardizing U.S. national security. These breaches occurred during her term as Secretary of State. “There is evidence to support a conclusion that any reasonable person in Secretary Clinton’s position should have known that an unclassified system was no place for that information,” Comey acknowledged. “Justice,” of course, is U.S. Attorney General Loretta Lynch of the tarmac meeting fame. Addressing the people of the United States, the FBI director actually said that “no outside influence of any kind was brought to bear” on the investigation. He neglected to mention the inappropriate meeting between former president Bill Clinton and Loretta Lynch aboard a private jet. Hillary Clinton is free to run for the U.S. Presidency, guaranteeing Obama’s third term. Arpaio’s challenger in the race is once again rough ‘er up Democrat Paul Penzone, funded by multi-billionaire Socialist George Soros, who is contemptuous of national borders. Soros also funds Hillary Clinton and John McCain. If convicted, Sheriff Arpaio could face up to six months in jail. A misdemeanor conviction would not bar Arpaio from serving as sheriff. You are currently browsing the Seeing Red AZ blog archives for October, 2016.